The foundation of any productive workday is an efficient and inspiring workspace. That's why it's important to create an office environment that utilizes the entirety of your workspace and allows you to work effectively. A desk built into the corner of the room is a great way to maximize the space in your office, keep your office organized, and give yourself a larger worktop area. If you've done a bit searching and can't seem to find a store-bought desk that fits your needs, we're here to help you build your own custom desk that fits your needs and dimensions perfectly. 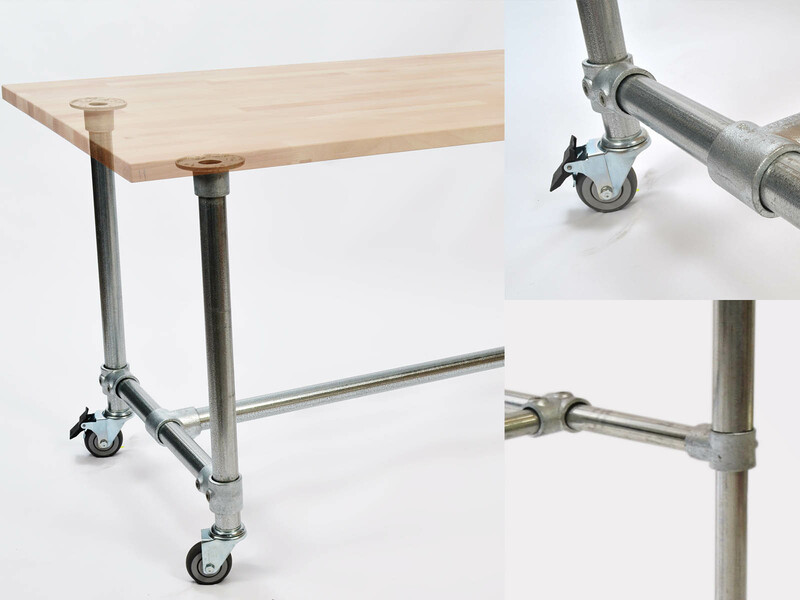 With Kee Klamp pipe fittings, it's not as difficult to build your own desk as you may think and we even make the process easier by offering a few desk frame kits. In addition, you can build any type of desk you like. 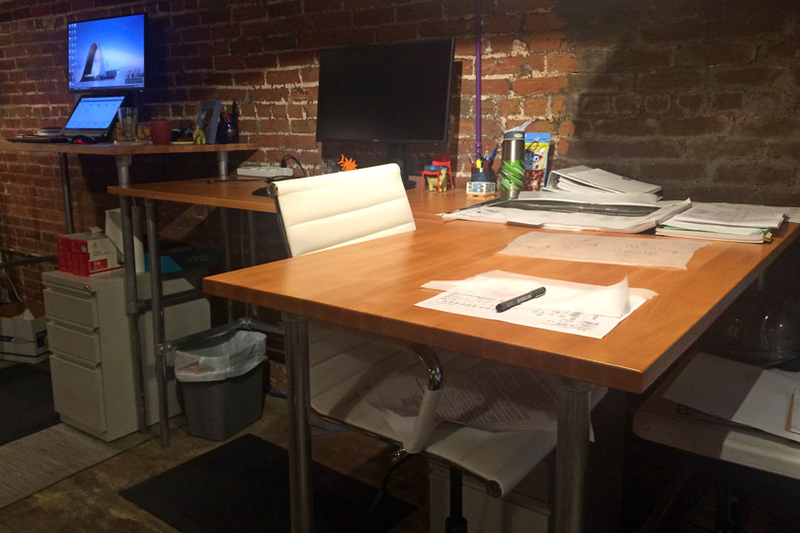 Be it a sitting or standing desk, long or short desk, wide or narrow; you can create a desk that is perfect for you. So to help inspire your own creation, we've put together this list of 17 DIY desk ideas for you to copy, draw ideas from, and/or modify for your own specific workspace. This desk was built by Christopher in Asheville, North Carolina. The desk fits into the corner perfectly and is large enough for multiple people to work at when needed. 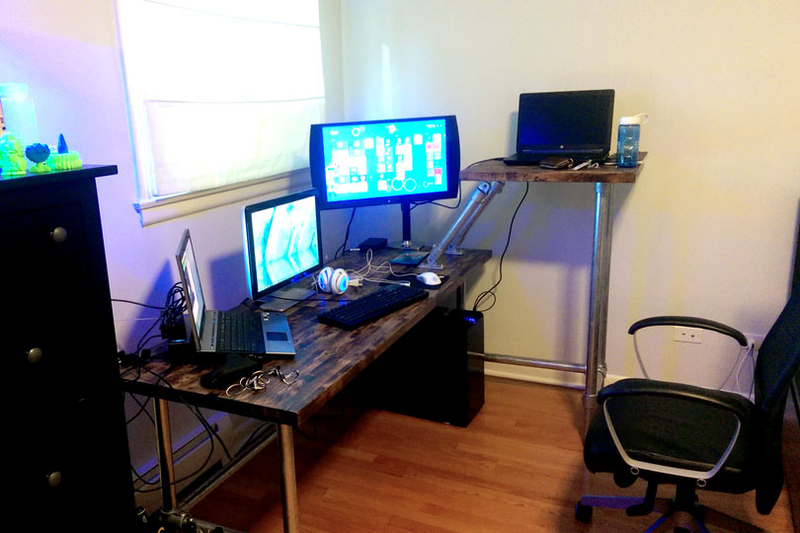 Christopher decided to build the desk when he came across a few of our wall mounted desk projects. He wanted a desk that did not have any legs in order to slide from one position to another without the desk legs getting in the way. Using the Kee Lite Swivel Flange, the desk table top is mounted to the wall. This fitting has a range of motion of 160 degrees allowing it to be used to create almost any angle. The table top also rests on two file cabinets on each end. 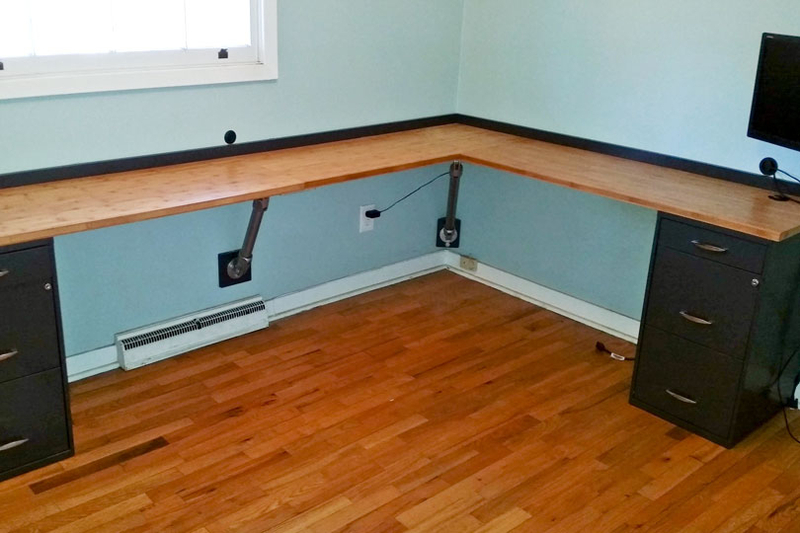 This L-Shaped corner desk built by Janet S. is both functional and pleasing to the eyes. 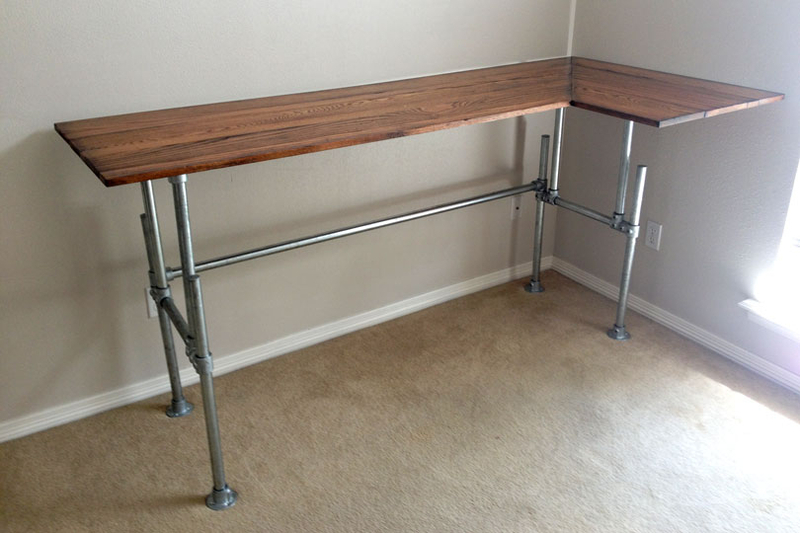 The steel pipes not only give the whole piece a strong foundation, but they also give the desk an industrial look.
" Regrettably I decided to save $ on a tight project budget and ordered the Kee Klamps from another company. That was a huge mistake on my part. They had terrible customer service! I will without a doubt order all of my parts from you next time....and I'm working on plans for the next project already." This desk built by Douglas in Charles Town, West Virginia, is similar to the idea above built by Christopher. It too makes use of the Kee Lite Swivel Flange to mount the pipe supports under the desk and to the wall. This gives the desk a clean, "floating" appearance. For Douglas, the desk functions as a workbench in his hobby room. "Happy wife, happy life". That's what Bruce was thinking when he designed this desk for his wife's craft room. The custom design features sections that are spaced out perfectly and set to the exact height to perfectly store his wife's various shelving and storage. 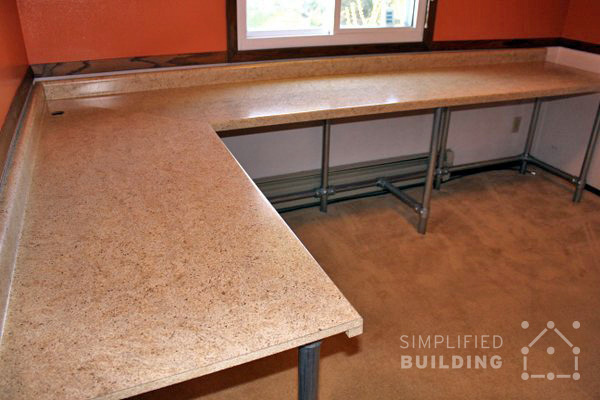 The desk also features a custom countertop that's finished on all edges. Bruce appreciates how sturdy the desk is stating: "It does not move or give when she is working on it." A full write up on Bruce's desk build can be found here. 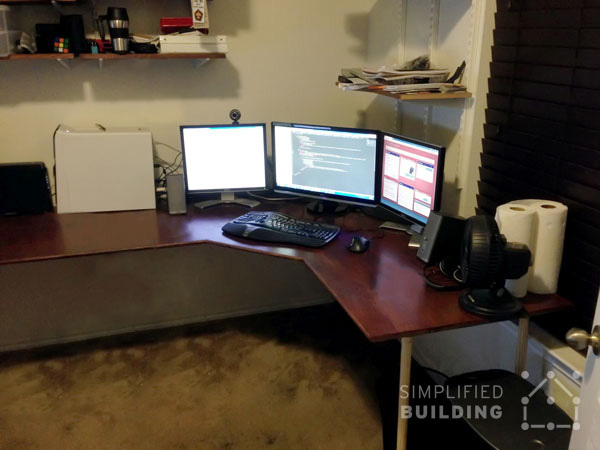 Take your corner desk to the next level by extending it in both directions like Robbie did with his desk. Robbie wanted to create something custom for his office and the result is this massive U-Shaped desk that wraps around nearly the entirety of his office. Unlike your traditional U-Shaped desk, Robbie's desk is custom built to fit the exact dimensions of his office to make for a clean and perfect fit. The desk provides an abundance of additional workspace, while still keeping the room itself open and uncluttered. One unique feature to note are the pine dowels Robbie used for the pipe component of the frame. Rather than using steel tubing, Robbie chose 1 1/4" pipe dowels to save on the cost of the frame. The pine dowels were 25% of the cost of normal steel tubing. 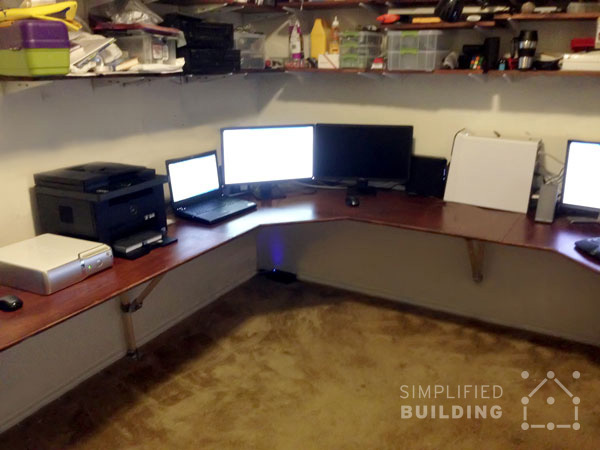 Built by Simplified Building's own General Manager, Chris uses this ergonomic desk in his home office. 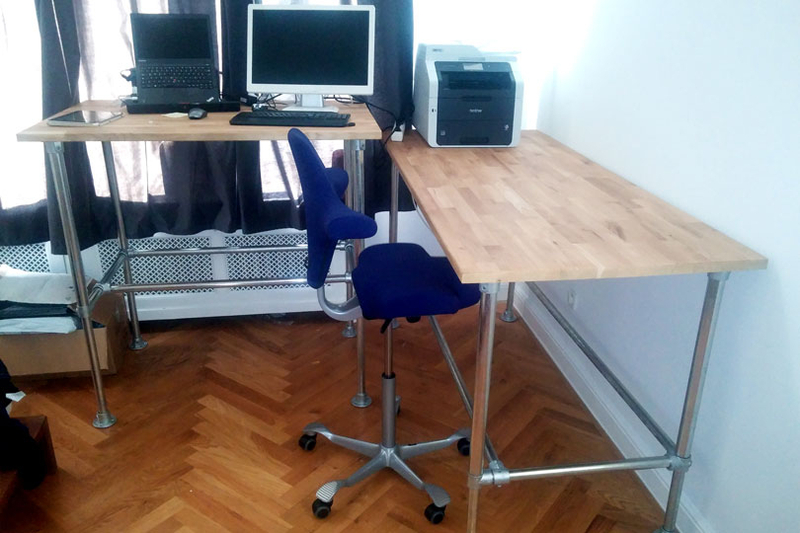 "The finished ergonomic desk is great: The keyboard tray allows me to place the keyboard at the exact height, the cords are hidden from sight, the shelves work well to store my router, modem, and backup device, and the finished wood matches all the other furniture in my new office." 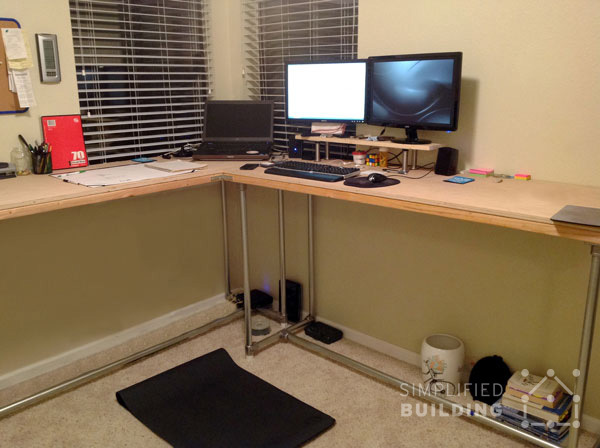 This standing desk was built by Jacob to relieve his back pain from spending too much time sitting down at a normal desk. Drawing inspiration from some of the other stand up desks we have on our site, Jacob got to planning. He wanted his new creation to be as large as possible to give himself a large work area. 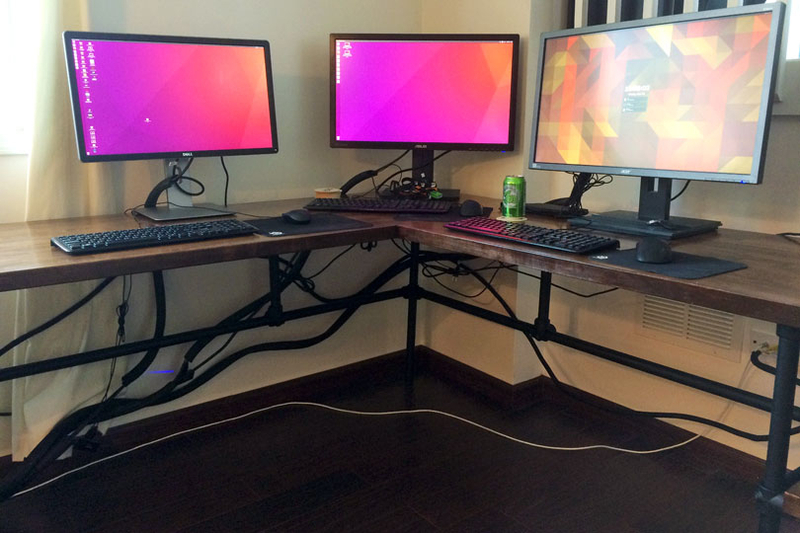 Jacob likes to use multiple monitors for his desktop PC so he needed something to accommodate his setup. Jacob appreciated how easy to adjust and modify the fittings was, a feature that came in handy as the " dry fitted" the frame several times when he was designing his new desk. Ultimately, he went with Kee Klamp because of its cost, ease of use, and movability. If you don't have an entire room as your office, but just a small space available, this DIY corner desk would be a perfect fit for you. The table top is made from reclaimed wood and the frame built using Kee Klamp fittings. The utilitarian look of the iron pipes complements the warmth of the aged wood perfectly. You can see more about this project, here. The desk itself fits perfectly in the corner without taking up too much space, giving the whole area a clean look. You can customize a desk like this one in the module below! All of the pipe and fittings needed to assemble the desk frame. This pipe has a maximum length of 21 feet, please select a smaller length. If your project needs to meet specific load requirements, please make note of that in the field above. 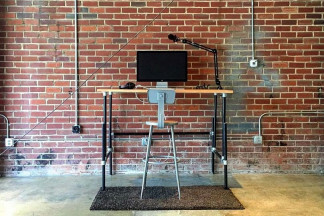 If you are interested in trying out a standing desk, but you're not sure that you want to make the long-term commitment, this is definitely the desk for you. This desk was built by Sims in Greenville, North Carolina. 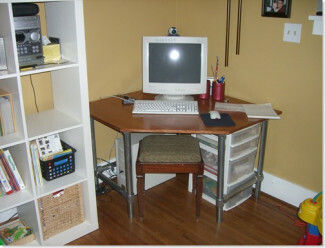 While not currently positioned in the corner (as pictured above), the desk could very well fit in a corner perfectly due its "L-Shaped" design. 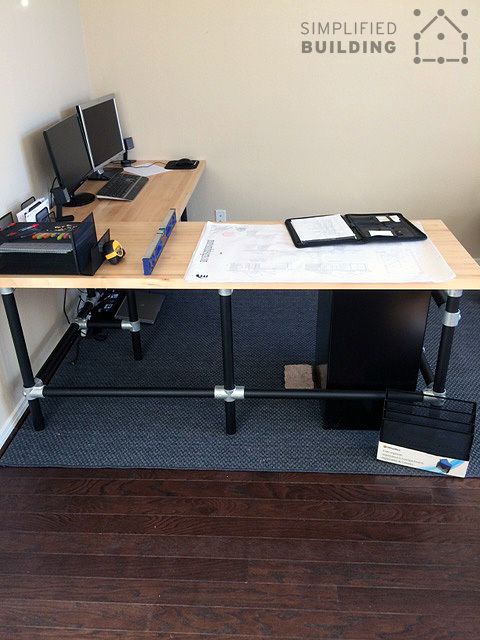 Our desk kits are configurable in length, width, and height. From there, you can combine the kit with any table top you like. In Sims' case, his office chose to use the Ikea Gerton table top. 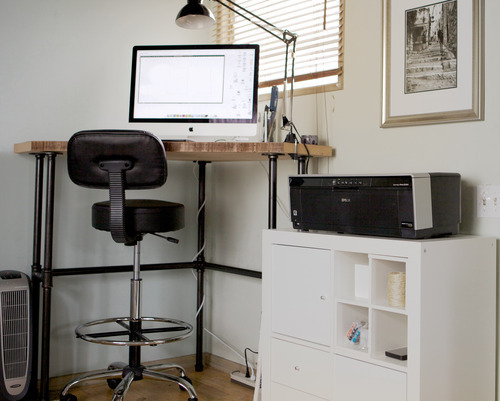 This diy desk is a different take on an adjustable height desk as compared to the adjustable height table kits that we offer. This desk can be adjusted by loosening the set screw on the Single Socket Tee that connects the horizontal support. With this fitting loose, the pipe leg can be position further up or down to adjust the height. The set screw on the Single Socket Tee can then be tightened back down to secure the leg in place. 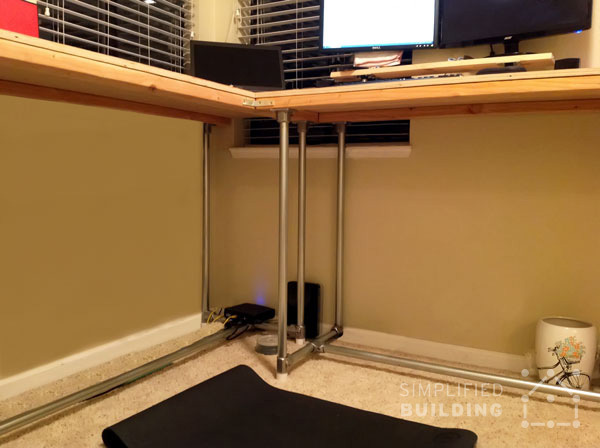 This allows the desk to be adjusted in height while still creating a unique desk frame. 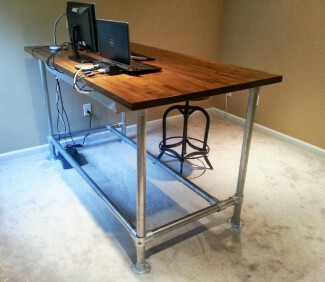 This desk was built by Michael in Dyer, Indiana after researching alternatives to pipe fittings. 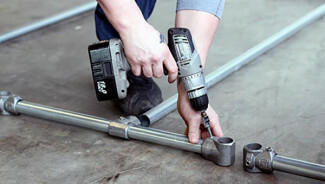 Unlike traditional pipe fittings that connect using a threaded connection, Kee Klamp and Kee Lite fittings slide over pipe and secure down by tightening a set screw. This generally makes them easier to use and more flexible (as they can be used in more untraditional ways as compared to threaded pipe fittings). So Michael decided to build his desk using Kee Klamp. The desk is quite massive measuring in at 8 ft. long on one side and 10 ft. on the other. If you want to read more about Michael's desk, he did a full write on his blog that you can check out here. 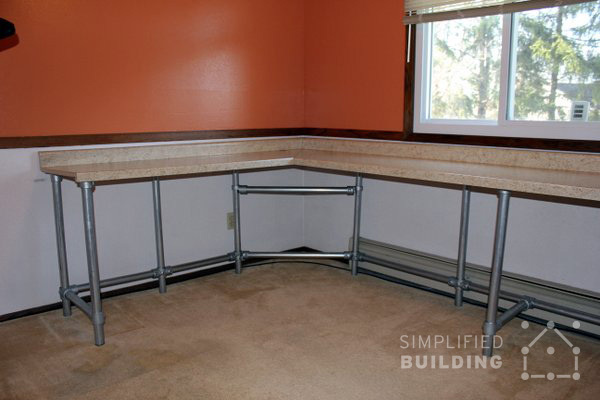 Instead of building a corner-specific desk, Jonas was able to use two separate pipe desks that fit into the corner of his home office. This way, should Jonas ever move or decide to simply change the layout of the room, he can simply move the desks side-by-side, on opposite ends of the room, etc. In Jonas' case, the desks are set at different heights. 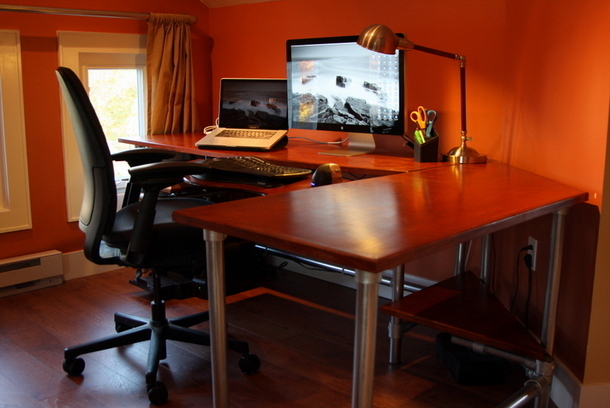 However, we've seen this approach with two desks of the same height to create a flush table top. This approach can give you more flexibility and since there are no drawers under the desk, this layout still provides for a clean look. 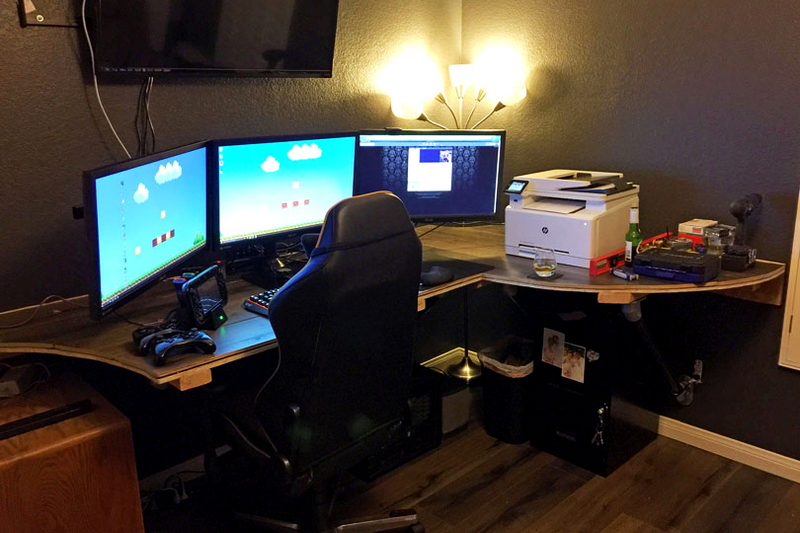 This DIY corner desk was built by Justin in Henderson, Nevada. The table top was custom built using some spare laminate flooring Justin had laying around. 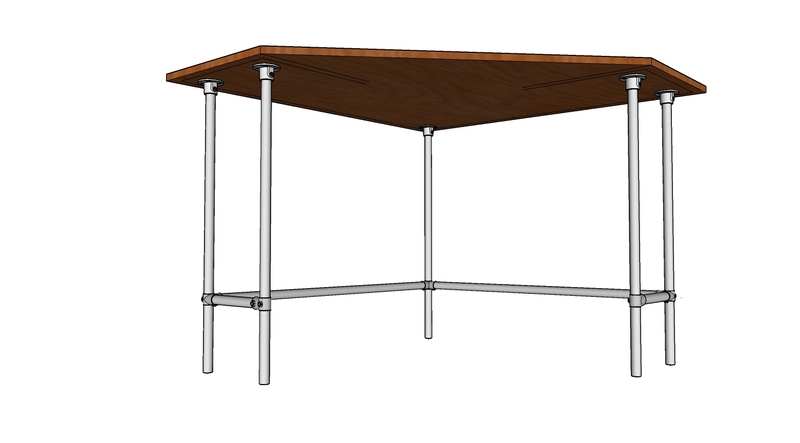 Instead of using the Swivel Flange like some of the other wall mounted desks on this list, Justin instead used the Angle Base Flange to mount under the table top and to the wall. The Angle Base Flange is a fixed fitting but it can be used to create an angle between 45 and 60 degrees. There are two holes in the flange to allow for mounting. This desk features a two-level setup that allows the desk to be used at sitting and standing height. On the lower top, the computer desktop can be used and on the upper level, a laptop can be used while standing. The upper level is connected to the frame of the desk. It also connects to the top of the desk by using the Swivel Flange fitting. The Swivel Flange fitting has a socket on one end to connect pipe and a flange on the other that can be used for mounting (there are two holes in the flange). The fitting is also free moving and has a range of motion of 160 degrees. This allows it to be used to create almost any angle. This desk was built by Corey in Montgomery, Texas. While again not positioned in corner, the desk could easily fit into a corner perfectly due to its "L-Shaped" design. 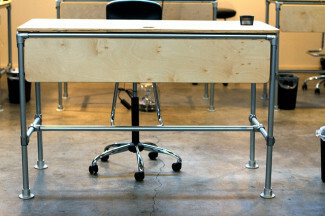 The desk features a rugged design that is complimented by the black spray painted pipe. The desk utilizes a solid Maple tabletop from Grizzly Industrial. 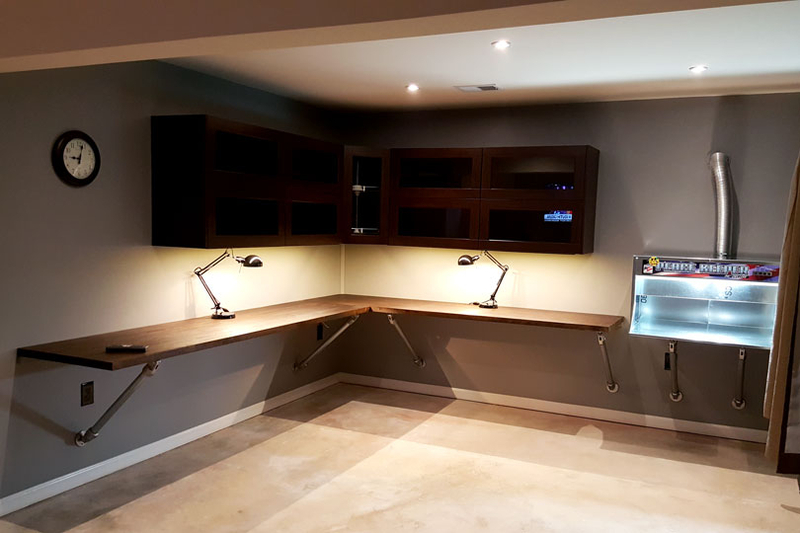 If you want to read more on this project and the fittings you'll need to build a desk just like it, you can check out the full tutorial and parts list here. Ever heard the quote, sitting is the new poison? While the idea of standing desks used to be reserved for eccentrics, now it is being adopted by people worldwide. 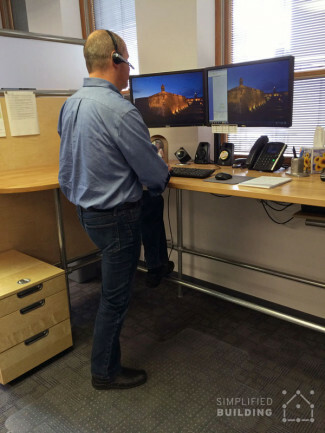 From reducing obesity, diabetes, and other cardiovascular diseases, there are so many benefits of standing desks. 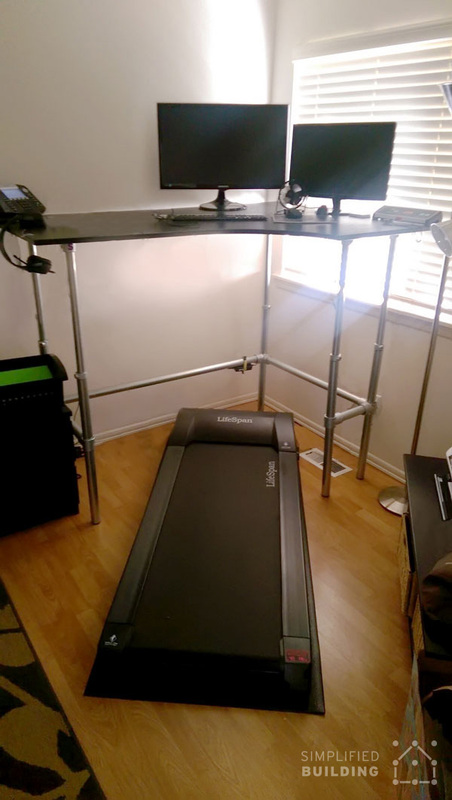 This one above was built by one of our customers, Lee W.
Lee wanted a desk he could use while exercising on his treadmill. 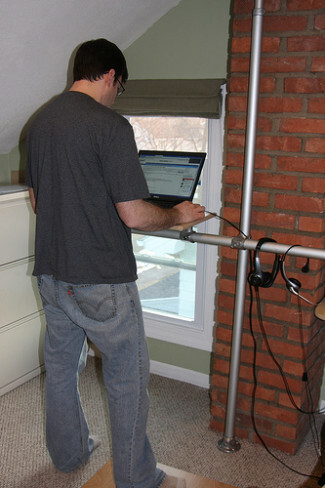 The resulting stand-up desk adjusts from 31" to 52" allowing Lee to position the desk perfectly. It's an innovative way to get work done while keeping fit by walking on the treadmill. This desk was built by Randy in Auberry, California. The desk features a 3-3/4" custom table top made from a natural live edge wood slab. The table top is very heavy but the heavy duty pipe frame supports the desk fine. If you want to read more on this project, you can find the full details here. With Kee Klamp, you will find that building almost anything is possible. The fittings give you the versatility to build any desk you want. If you're thinking of building you're own corner desk, make sure to browse our list of fittings and desk frame kits to find a solution that works for you. Lastly, if you need any design help or assistance picking out the right fittings to use for your desk, our staff would be happy to help. Our trained experts will help you with any kind of project assistance you need. We look forward to hearing about your next DIY success story!